[00:00] What happened with you this week? - The show starts off with an important announcement: We've decided to record our main podcasts every two weeks now, rather than weekly, because they are a lot of work and we are getting more and more homework to do at the weekend. Then, every other week we'll do a short podcast, where we play the Big Bag of Random, or something like that. But rest assured, we are still going to do them regularly, just every other week now, so keep listening. We talk about our latest 'meme' videos on YouTube, and our amazing new pocket-size vlogging camera - see the Thing of the Week page for more details about that. And we've gone mad posting funny things on the NiliPOD Instagram page. Check those out. We've got 500 followers now, and last week we only had 50, so that is good. And we've got a theme where we do things in threes. Take a look and you will see what we mean. We do some shout outs to some Australian fans who call themselves the Grumpy Middle Aged Men, who also have a podcast and noticed us next to them on iTunes. We've had a lot of new subscribers on YouTube since our last podcast, so a big shout out to our number one fans My Baby Videos and Rachel Daughtery, who loves watching the Yee dinosaur videos. Other shout outs go to YouTube subscribers Unicorn Magic, Sabrina Domingo, Charlotte Curtis, Cakin' It, Skyler Walen, Lee Hall, Kristina Bayburtsyan and Meryem Kahya. Thanks guys. We discuss the exciting fact that we were on the iTunes 'New and Noteworthy' page the other day. Did you know that? Please give the NiliPOD a review on iTunes if you can, as we'll give You a massive shout out and maybe even blow you some kisses down the microphone. This week we've been back to school after the long Christmas holidays. Nia has been choosing her options and is really looking forward to doing photography, French and other GCSEs, but Liv is already at the college and is really enjoying media studies and history. 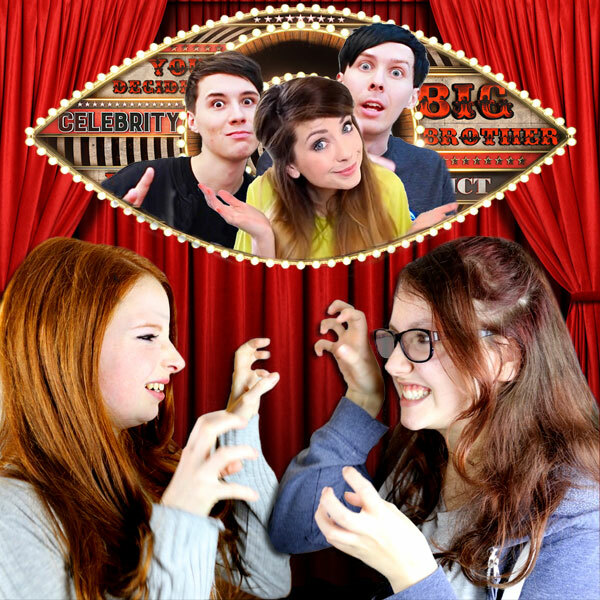 We talk about New Year's Eve and the funny Trivial Pursuit farts, not to mention the epic marathon Monopoly game that we played, where Nia managed to get Leicester Square - because of Phil Lester! Nia explain how excited she was to get the Dan and Phil calendar for Christmas, until she found out it was the 2015 one. Never mind. [09:50] YouTube Video of the Week - This section starts off with our very dramatic new jingle, which certainly sets the tone and sounds a little bit like it has been sung by David Bowie. We mention our new website page, the Top 100 YouTube Videos - Ever and then discuss the most popular YouTube videos of 2015. These are all pop videos (of sorts), but where did Adele, Ellie Goulding, Little Mix, Sia, Taylor Swift and Wiz Khalifa appear in the top ten? And then we are amazed that there are seven billion people on the planet, and over two billion of them have watched Gangnam Style. Crazy stuff. [14:40] Am I A Big Brother Celebrity? - Liv has been busy watching Celebrity Big Brother, but Nia is rather confused about who Emma Willis actually is. She's the person in charge, obviously. The bed mysteriously starts to vibrate and then Nia reads out a list of all the so-called celebrities appearing in the show this year, and Liv decides whether or not they really are a celebrity or a nobody. It turns out that this year's Big Brother is pretty much full of nobodies, some of which are being paid huge amounts of money to grace our screens this year. However, Liv has heard of Angie Bowie, who is the mummy to Zowie Bowie, and Kim Kardashian's friend with the funny eyes. [20:40] Good News - As we've been away for the Christmas holidays, there are so many great news stories that we have to catch up on this week. We concentrate on all of the nicest stories that have appeared in the newspapers so far this year, in 2016. Some of these are big stories, while some of these are just plain daft. Harry Styles and Eddie Redmayne were both spotted shopping in supermarkets and basically acting like 'normal' people, the weathermen have said that it is going to get colder and Liv is convinced that snow is on the way soon. Louisa Johnson, off of the X Factor, didn't do very well with her debut single, and tinker Brooklyn Beckham has been taking pictures of daddy David with chocolates all over his face while he was sleeping. Other stories include rude staff at a McDonald's branch, Justin Bieber dropping his trousers, Cara Delevingne and the Mona Lisa, Tom Daley's frying pan with compartments, Marcus Butler and Niomi Smart splitting up, and that weird viral picture of a dog with ham on its face. Zoella and Alfie Deyes have been complaining about their lack of privacy, Chris Evans isn't getting on very well filming the new series of Top Gear, and Jennifer Lawrence always seems to get drunk and throw up on New Year's Eve. And there's chart history this week with Justin Bieber taking the number one, two and three spots. [30:50] Another Star Wars Interview - This week it's the final installment of our crazy Star Wars interviews, when we met some of the cast in our local Lidls supermarket recently. We talk about Han Solo's sad demise in The Force Awakens (spoilers) and whether he may actually be appearing in the next film, whatever that is going to be called. And then Jar Jar Binks is interviewed for the NiliPOD, but the stinky floppy eared Gungan military officer was not keen and clearly had a flatulence problem. [34:15] Nia vs Liv - The challenge for this week is so much fun and causes a combination of confusion, hilarity and competitiveness. It is the 'Celebrity Rhyming Game', where we read out cryptic clues to each other so that we can each take it in turns to guess the celebrity and what they are doing. But it must rhyme, like 'Obama stroking a llama'. This was a really good game and we'll definitely be playing this again in the very near future. Zoella, Joe Sugg, Tom Cruise, Harry Styles, Britney Spears and Prince Harry all make an appearance in this challenge, but what are they doing that rhymes with their names? Send in your own ideas for the next round of this challenge. [41:45] End of the Show Time - Things are rounded up for this week's Celebrity Big Brother podcast and we talk about how much the world's top five YouTubers are making at the moment, and it is a staggering amount. Finally, we finish up with 'What's coming up soon? ', such as those 3D Google goggles, GQ magazine's best dressed male celebrities and of course, that Big Bag of Random will be back. We're really, really looking forward to that, as we've just written loads of things for the bag.